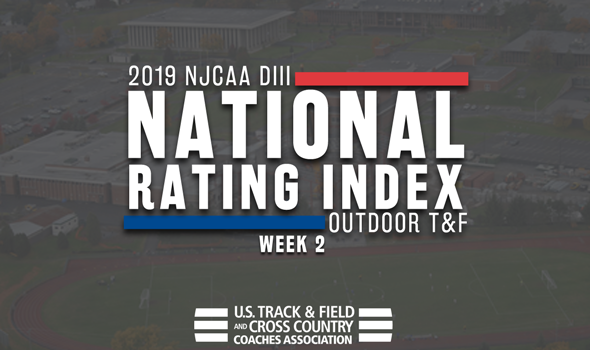 NEW ORLEANS – It’s time to look at the NJCAA Division III Outdoor Track & Field National Rating Index with one month to go until the NJCAA DIII Championships. There were some big changes in the most recent edition, which was released on Wednesday by the U.S. Track & Field and Cross Country Coaches Association (USTFCCCA). A familiar face is back on top. That face belongs to Harper (Ill.). The Hawks, who have roosted quite a bit at the top over the years, recorded eight new top-3 national marks over the weekend, including a top billing that belongs to freshman Sean Sanaghan in the 1500. Other than that, top-3 marks have come in these other events: 800, 10,000, 4×100 relay, 4×400 relay and the triple jump. Former No. 1 Triton College won’t back down, though. The Trojans posted six marks this past weekend that fall into the top-3 nationally, including top billing to National Athlete of the Week Demariye Carpenter in the 100 and their 4×100 relay. Cooper is also now ranked second nationally in the 200. Rowan-Gloucester CC held steady at No. 3. The Roadrunners still have four top-ranked entries in the National Rating Index and added a top-3 mark in the guise of Josh Varghese in the shot put this past weekend. Hudson Valley CC remained at No. 4, while Suffolk County CC moved up to No. 5. Suffolk County CC took over the top spot of the Women’s National Rating Index. The Sharks starred this past weekend as they added four top-3 marks to the Descending Order List. Allaura Dashnaw is now ranked No. 1 nationally in the steeplechase and Nigeria Jones soared to the top spot in the high jump. Malaika Pierre-Louis is ranked No. 2 in the 100, while Jodi Cochrane is No. 3 nationally in the pole vault. Former No. 1 Harper (Ill.) fell to No. 2, but received strong efforts from Grace Carey and Taylor Kreiss this past weekend. Carey is now ranked No. 2 nationally in the 400H, while Kreiss comes in at No. 2 nationally in the 10,000. Rowan-Gloucester CC didn’t budge from the No. 3 spot in the National Rating Index. Not after Elisia Lancaster and Emily Hilt proved to be the best in the nation so far this season in the hammer throw. Lancaster and Hilt are ranked No. 1 and No. 2, respectively. The top-5 is rounded out by Union County (N.J.) and Kingsborough (N.Y.) after they swapped spots between Week 1 and Week 2.